By Erynn Beaton, Maureen A. Scully and Sandra Rothenberg. Ample research indicates that the growing problem of wealth and income inequality could stunt U.S. economic growth and undermine our democracy while stirring political polarization. Given that the federal government shows little interest in fighting economic inequality and many states are ill-equipped to do much about it, what else can be done? Studies have also found that the rich exert far more influence over government than the rest of us. This imbalance means that wealthy people who do something about inequality may have more power to make an impact than everybody else. As scholars of social change, we wanted to learn more about how a small number of affluent Americans choose to spend their own time, clout and money fighting inequality. The latest official estimates indicate that the richest 10 percent held 76 percent of the nation’s wealth as of 2013. That means for every US$10, these Americans own $7.60, leaving $2.40 for the remaining 90 percent. And the concentration of wealth is only getting worse. The richest 10 percent held only 67 percent of the nation’s wealth in 1989. Growing inequality is inspiring some rich people to do something about it by influencing public policy and corporations. 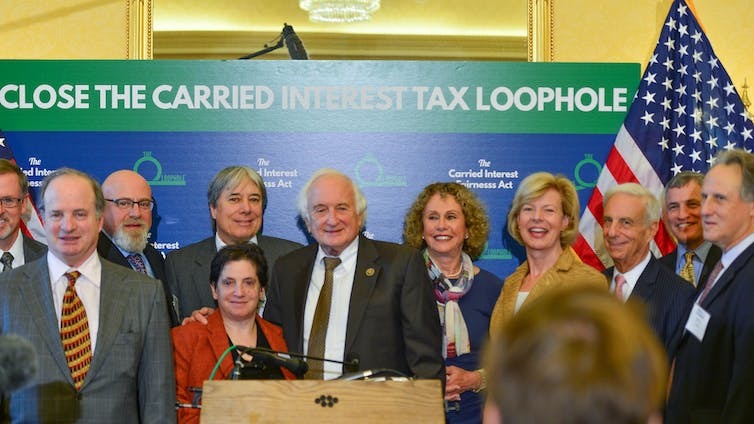 For example, Morris Pearl, previously the managing director of investment firm Blackrock, has lobbied to close the carried interest tax loophole, which many financial managers use to significantly lower the income taxes they pay. Hamdi Ulukaya, founder of Chobani Yogurt, gave his employees an ownership stake in the company prior to its sale, even though he could have made more himself if he had not. To learn more about people like him, we conducted interviews with 20 people who live across the country and belong to a nonprofit organization dedicated to creating a more fair economy. (We agreed not to name it.) All of the people we spoke with consider themselves to be “wealthy allies” who work alongside people of much more modest means to reduce economic inequality. These rich people epitomized wealth in America: most were white men. They spanned all ages. Some had inherited their fortune, while others were raised in households with modest means and made their wealth over the course of their careers. Like Zlotnitsky, most wealthy people fighting inequality who we spoke with told us they had gone through a reflective process to recognize the advantages their status has afforded them while getting involved in this effort. First, they accepted that they partly owed their wealth to a system that works in their favor and not merely to their own merits and efforts. Realizing that they owe their wealth partially to systematic advantages and luck was challenging because it requires overcoming the popular belief that people get what they deserve. Chuck Collins, who inherited and gave away his share of the Oscar Mayer fortune, told a tale of self-awareness in a memoir he called “Born on Third Base.” Collins now advocates for preserving the estate tax and does research on inequality to bring more attention to the issue. The next step is overcoming shame. Acknowledging their privilege made many of the people we interviewed feel ashamed. For example, a bisexual woman who inherited nearly $1 million on her 21st birthday said she found it harder to come out to her friends as wealthy than as a lesbian. Hearing over and over that identifying as rich was disconcerting surprised us because many Americans claim their wealth as evidence of merit. In addition to overcoming their guilt and shame, wealthy allies often fear the ire of other rich people. 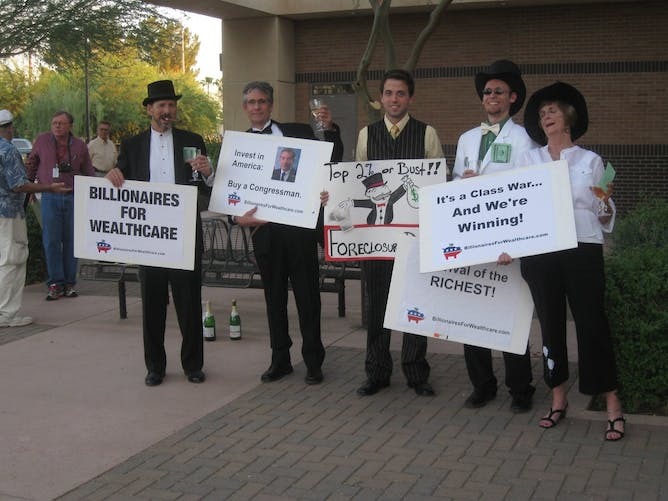 Their peers got mad at them for doing things that arguably violate their own economic interests, such as advocating for taxes targeting the rich. The people we interviewed all said they consider these challenges hard but necessary parts of the process of becoming a wealthy ally. Many said they relied on people like themselves for moral support. Most of the rich people who try to do something about inequality give some of their money away. Yet philanthropy isn’t an ideal tool for fixing inequality, as research by economists like Indraneel Dasgupta and Ravi Kanbur has shown. The rich people we interviewed who wanted to side with the poor seemed to think about philanthropy differently than their peers. All donated at least some of their wealth, and some have given their entire fortunes away. But most of them also tried to go further by lobbying Congress to raise taxes on the rich or urging corporate boards to raise worker pay – two potential ways to reduce inequality. Some of the people we interviewed said they believed that they had found another path to make their philanthropy more effective. For example, one man admitted to himself that he might not be the best person to determine where his money should be spent. After years of giving money to charities started and run by upper-middle-class men like himself, he began giving to organizations that were started and led by the poor. In this way, he handed over his elite power to the poor, trusting that they knew better how to raise themselves up than he did. As this example demonstrates, acting as a wealthy ally to dismantle economic inequality requires a paradigm shift. Wealthy allies said they believed that the most effective way for them to fight inequality is by willingly handing over their power to the poor. This shift can make it uncomfortable for rich people to join the movement to fight inequality. But if their efforts help preserve our democracy and our economy, it may be worth it. This entry was posted in Business, Capitalism, Discrimination, Inequality, Social Change, Social Order and tagged Charity, Chuck Collins, Economic inequality, Hamdi Ulukaya, Morris Pearl, Philanthropy, T.J. Zlotnitsky, Tax, Wealth. Bookmark the permalink. It is wrong to tax more wealthy and distribute it to poor.Most of the poor particularly in USA are lazy.They want to do the same thing which they did in past whether they are useful to the society or not.The do NOT want to use there brain and innovate.Poor is synonimus to laziness and stupidity.If somebody is very intelligent he need not work under some one who pays less. If you tax too much rich they will loose motivation to innovate which is bad. The solution is poor people should be discouraged to have children.In USA there are plenty of opportunities to innovate.Still someone does not innovate means he is lazy. By doing innovation sky is the limit for earning money. Innovation leads to a lot of stress.Poor does NOT want to take stress but they like to loot hard working rich.The poor population shall shrink.Government should tell poor innovate or perish.